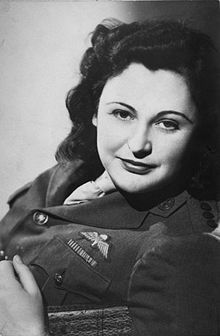 ... 1912 (100 years ago today), Nancy Wake was born in Wellington, New Zealand. She, her parents, and her five siblings moved to Sydney, Australia; soon after, their journalist father left them. Wake herself left home as a teenager, eventually traveling to New York and London and settling in Paris, where she was a free-lance writer said to be fond of the French city's nightlife. By the time Nazi Germany occupied France, she was living in Marseilles, the wife of a wealthy French industrialist who would be executed on account of the couple's work for the Resistance. Wake herself went to England and joined the Special Operations Executive, a British spy agency about which we've frequently posted here, here, and here. Parachuted with into France in 1944, Wake worked behind the enemy lines as a spy. The Germans nicknamed her la Souris blanche because she could not be captured. After the war her efforts were recognized with Britain's George Medal, the U.S. Medal of Freedom, and the French Legion d’Honneur. Wake, who published her memoirs, The White Mouse, in 1997, died in London a year ago this month.